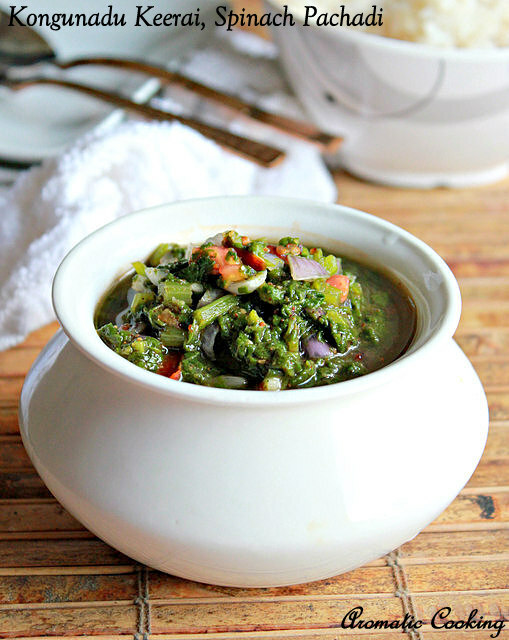 Kongu Nadu Keerai, this is a recipe that I had jotted down many years back and I had tried it once then. After that, when I wanted to do it, I thought I had lost the piece of paper, then finally after so many years, I found it back, all neatly jotted down in a notebook. 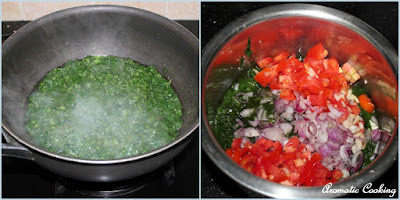 I had taken it from a TV show, and I think it's a kind of spinach preparation done in Kongu Nadu region ( Coimbatore, Erode,Salem, Tiruppur and some more places in Tamilnadu, India belong to this region ). 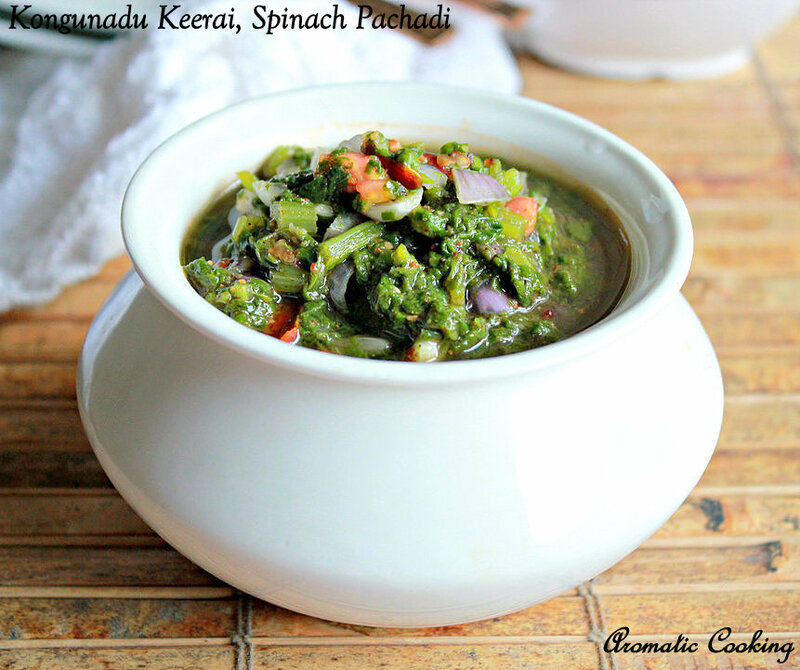 The recipe is very simple and different, it's like a Pachadi kind of dish and it goes very well with plain rice, give it a try next time when you make spinach..
Cook the chopped spinach with about 1/2 cup water and salt. Soak the tamarind in 1/4 cup hot water, extract the juice, strain and keep. Dry roast all the ingredients given under ' To Powder ', cool and grind it and keep. Chop the onions, garlic, tomatoes, slice the green chillies and keep. 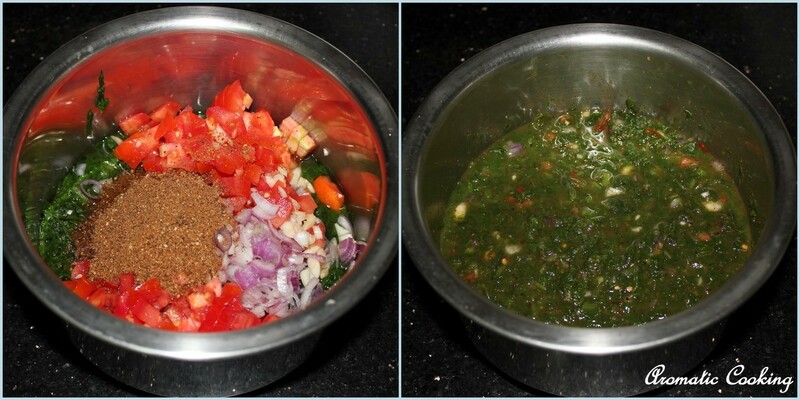 Once the spinach is cooked, cool it a little, add the tamarind extract, chopped onion, garlic, chillies and tomatoes. 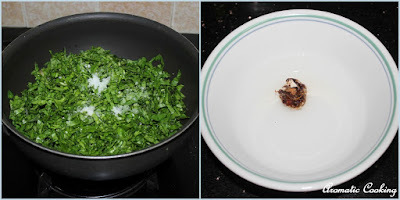 Add the ground spice powder, mix and using your hands, coarsely mash the spinach, finally add the coconut oil, mix and serve it with hot plain white rice. When you mash and chop the garlic, it gives more flavor and also use small onions only in this recipe. Cook the spinach uncovered, so that the green color is retained. healthy and yummy pachadi!! love the pot!! healthy and tasty pachadi.. Love the presentation..
What a delish and vibrant looking pachadi. AWESOME.